The humble macaroni and cheese ... can there be anything different about it than your average dish of mac & cheese? According to our family, there certainly can. After all, back when my mother was was making this (maybe even her mother too) dish, there wasn't such a thing as Kraft Dinner in a box ... and there definitely wasn't any such thing as powdered cheese either. Besides this being a dish we (myself and my sister) as kids looked forward to (probably as much or more as today's toddlers and kids), it was one of our most beloved "comfort foods". 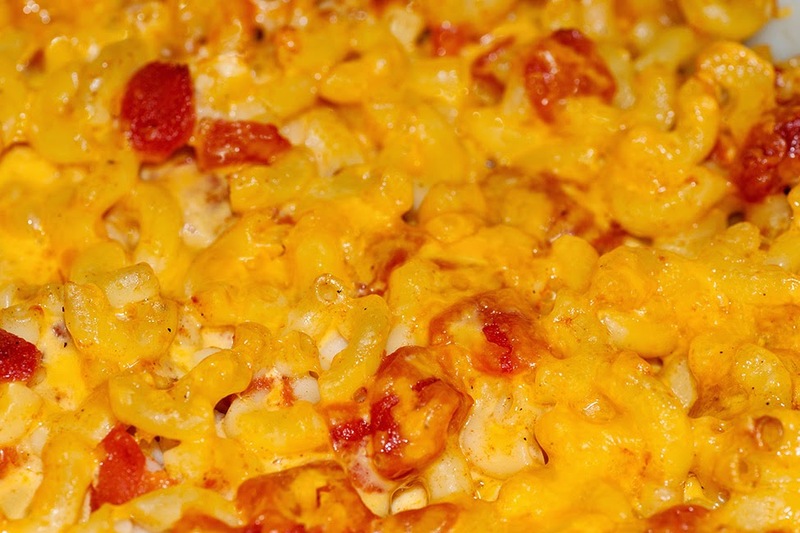 There just was nothing like mom's macaroni and cheese. 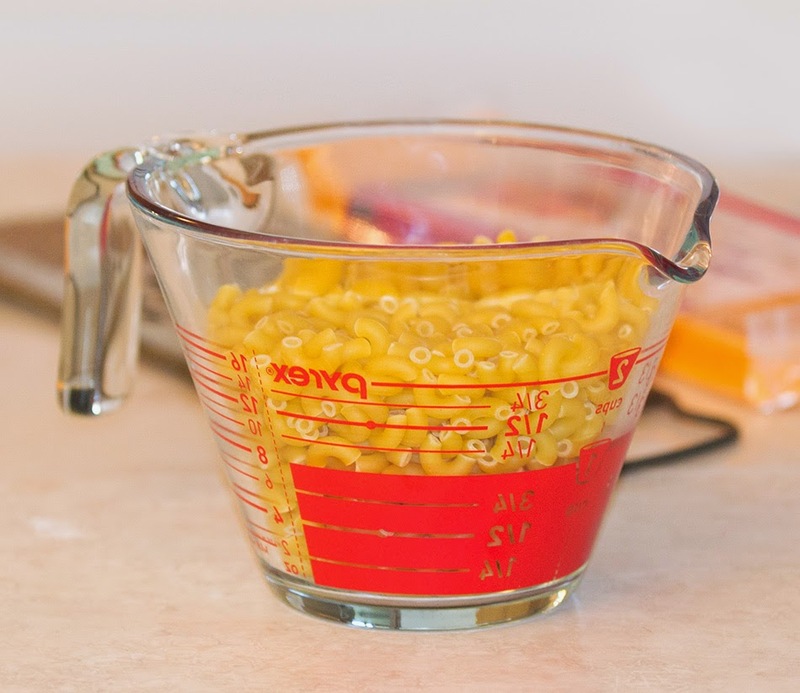 In modern kitchens where mom's are busy, and kids even busier, speed is often a necessity at some meal times and out comes that box of KD - which I suppose is one of the "comfort foods" for today's kids. My own "kids" (grown up with their own kids) still prefer my mom's recipe over anything in a box, or anything frozen. Mom's doesn't have that creamy, saucy type of cheese. It's good old fashioned cheddar, shredded up. Her cheese of course, was carved off a large block at the cheese shop but still ... the block of "real cheddar" at the grocery store is way closer than any powder mix. It's a simple dish, with a simple recipe - only three ingredients. And because of the amount of cheese, it's not exactly the cheapest dish you can make anymore. So, here's the recipe - you can adjust the amounts for the number of people you plan to serve. There isn't all that much involved in the preparation since there are only 3 main ingredients. What pasta you choose can make a difference in how long you need to cook the elbows, and how good the results are. My mother always relied on Lancia pasta ... as did I until I tried Barilla when it was first available in Canada. I've used nothing but Barilla since then. The Barilla I cook for about 10 minutes. The amounts quoted below served two men (hearty sized servings) and me (a smaller serving), with enough left over to send one guy home with another dish full, and enough for two lunch sized servings for my husband and I. Note here that since my mother didn't include measured amounts in most of her recipes, I had to measure along the way. You'll see from the photos that I used a "wet measure", even for the dried ingredients so take that into account if you are the type that actually follows everything exactly. This particular measure is one of the newer styles from pyrex - narrow at the bottom and opens into a wider space at the top, but the nicest thing about this one is that the measures are on the INSIDE of the cup so when you look into it, you can see exactly how much you've got. You don't want the elbows "mushy" or too soft - al dente is probably fine but keep in mind you still need to bake this in the oven for half an hour, and since there will be juice from the tomatoes, it will continue to cook the pasta a little. Dump the elbows in a large pot of boiling water. While they're cooking shred the cheese. I have yet to find any brand that sells the pre-shredded cheese with an "old" cheese - they're either mild, medium or mixed and flavoured. Not what I want for this dish, so I usually end up buying a block of cheese. The one I purchased today for this recipe was 500 gr (or, just over a pound, which is 464 gr). I cut it in half and shredded all of that half. It worked out to almost 4.5 cups of shredded cheese. When the pasta is cooked, drain it and dump it into the greased bowl. 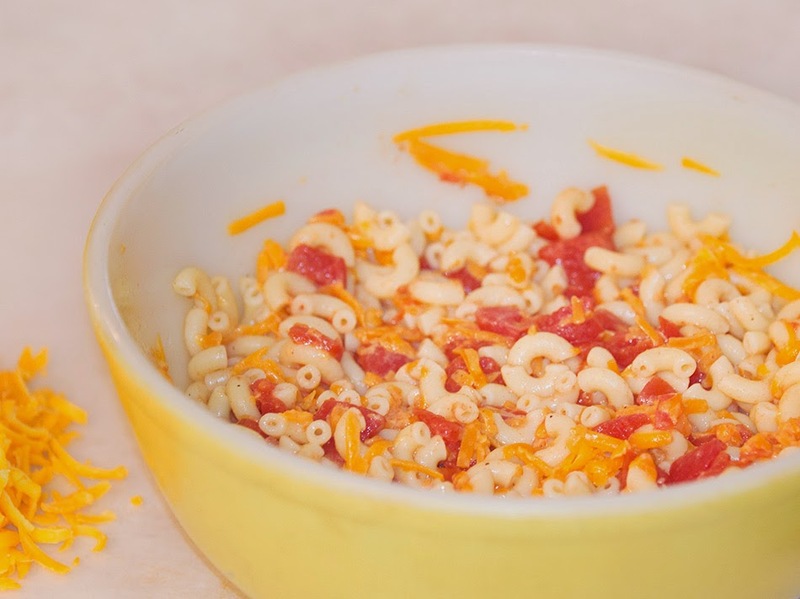 Add 3/4 of the shredded cheese, and the tin of tomatoes (okay, yes, please dump the tomatoes out of the tin first), as much salt and pepper as you like, and mix it up with a wooden spoon. 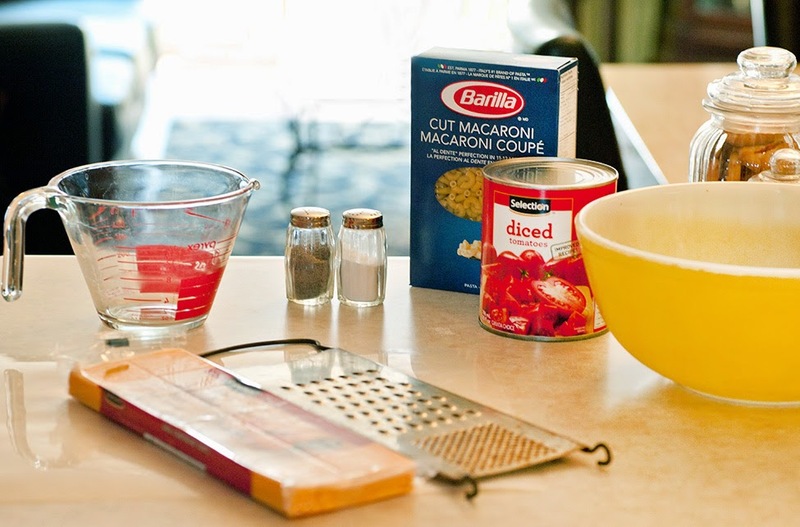 Spread the balance of the cheese on top of macaroni and you're ready to bake it. Typically, I make this up in the morning and put it in the fridge until an hour before we plan to eat it. You can bake it immediately after the prep stage if you want (in other words, you don't "have" to refrigerate it before cooking.) Preheat the oven to 375 degrees, and when it's ready, pop the bowl in the oven and bake for 30 minutes. Serve with hot, thick sliced fresh bread (garlic bread is a nice change) or dinner rolls. About the Bowl: the bowl my mother used (and which I also use) is just an old pyrex mixing bowl. These came in sets (small/turquoise, medium/red, large/green, xlarge/yellow). Being pyrex, they were also safe to use in the oven. I can't say why she used it, other than it was probably the only thing she had that was large enough to hold the whole batch (what I made today doesn't fill the bowl, but she always made enough to fill it to the brim). You can use whatever you've got or like. About the Grater: yes, it is old. It's what I've had for a long time, and it was old when I got it from my mother. There are lots more modern ones on the market (and I've even owned some), but I always go back to my old stuff. Cooking isn't always about the "food" ... I think it's often about the memories and feelings. NO - do not substitute the cheese (maybe I should say don't "sacrifice") and use something like Velveeta. Uhuh. Use real, honest-to-goodness cheddar. Okay - if you don't like old, use mild or medium. If want a little more heat, use TexMex. BUT - this is the about the most basic recipe you'll find. Because of that, you can take the basic instructions and make it your own. The recipe being here is really for my kids and grandkids. 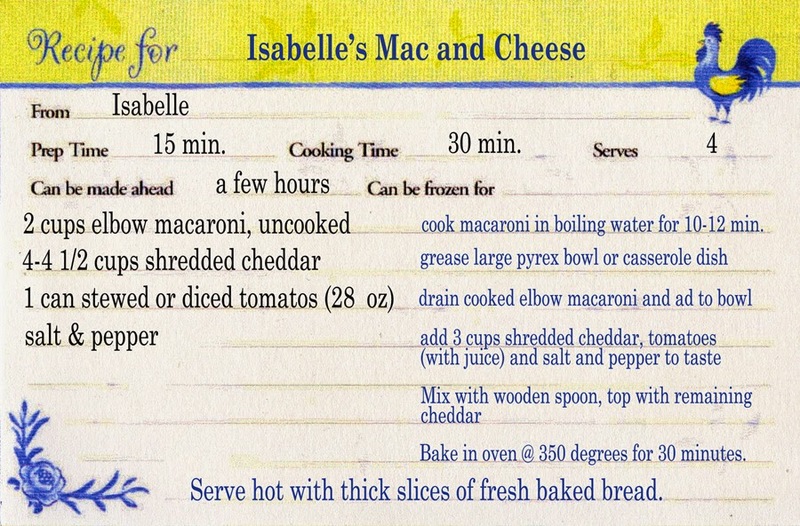 When they ask for "gramma's mac and cheese recipe" I can point them at this post. Anyone else can do their own thing with it. Make your own family recipe by adding things you like - maybe red and green peppers or even peas (don't ask, but they do work in this for something different) or (gag) ... some kind of meat (like ground beef). My husband likes it with ground beef. Me, not so much. Oh, it tastes okay (good even), but what it isn't once you add the ground beef is "mom's mac and cheese" ... it's an ordinary goulash style mix, kinda like "Hamburger Helper" if you ask me. And for me, this particular dish is all about ... home and childhood!